W-wa Jeziorki: Do not take this road! The Droga Krajowa (national road) 10 is a road that makes its way north-westwards to Szczecin and on to the German border, connecting the cities of Toruń and Bydgoszcz along the way. It starts near Płońsk, where it joins the DK7 (E77), the Gdańsk-Warsaw-Kraków road. So it is a significant road, with transit traffic (especially Germany to the Baltics), and it connects three cities that between them have over a million people living there. 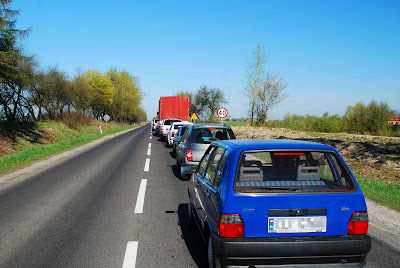 Yet this road (in particular the Sierpc-Skępe-Lipno section between Płońsk and Toruń) is so bad as to be avoided at all cost. The reason - roadworks. In this 34km section alone, there are 12 contraflow sections. If you hit a red light here - and I hit nine - you will wait up to four minutes at a time. It took me 75 minutes to cover 54 km (average speed 44 kmh/27 mph) where the roadworks were most intense. The entire 220km trip from home to Toruń took four hours - thats 55 kmh or 34 mph. This is appalling. It hurts the local economy, the national economy and the European economy. I was in Toruń for an economics conference; also attending was the Ukrainian ambassador to Poland, who was also held up along this dreadful road. He said that 'at least Poland has roadworks going on' - except the man had never travelled this road last year, in 2007 or in 2006 where the same stretch of road was also being dug up and subject to lengthy delays. The whole process is dreadfully slow, with no end in sight. 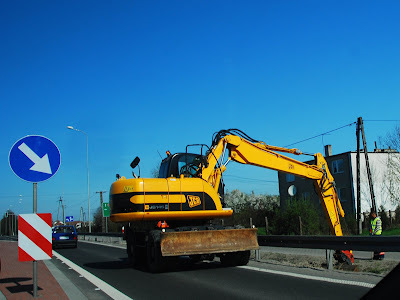 When I last travelled the DK10 two months ago, the roadworks finished at Lipno. Now they extend right up to the border of Toruń powiat (district). I returned home via Włocławek and Płock (south of the Vistula), with a particularly beautiful stretch of empty road between Płock and Kamion (the 575) This is not a fast road, as it passes through village after village, but it is empty and the landscape at dusk on a sunny day is glorious. From Kamion on to the DK50 (Warsaw transit route) then down to Sochaczew (to the west of Warsaw) and home along the DK2. Also being dug up. Another 40km at snails pace. Desisionmakers seem to have no clue how to improve things. I had to move houses when my peaceful country road (I used to live outside Toruń in Łysomice) was turned into an international road (DK1) from the south of Europe to Helsinki. That was when the highway A1 bridge was built, but not the highway itself:) So they decided to make a "beltway" for lorries to avoid having them in Torun - which meant I had them alsmost in my front garden. I had traffic jams stretching before my house for miles: all commute paralysed. Then they added few factories and logistics centres to complete the landscape. Thanks Paweł for your comment - such is the problem with development - local communities shattered so that international transport routes can be extended. Once they're built though, life can be rebuilt afresh - I hope you were adequately compensated by the state for your forced resettlement.